Ask fellow campers about "Lewis and Clark Village State Park" and nearby attractions. This is a really nice park with good displays on the historic Lewis & Clark expedition. We had a pull-through site that was plenty long enough for our rig, electric only. The campground was fairly empty, although more came in for the weekend. The grounds were clean and well-kept. Dump station is conveniently located. We enjoyed our stay here and would come back again. Across the river from Atchison, KS, with places to eat and shop. We camped at Lewis and Clark Village State Park in a Fifth Wheel. This is a nice Missouri State Park located in a small village surrounded by farmland. It is a place to stay while visiting St. Joseph, MO, even though it is 30 minutes away. We had strong 30 amp service. There was no water at the site; the easiest place to fill a tank is at the dump station, but there are a few faucets located throughout the campground. We did not use the bath houses, but did note the nice laundry room. The sites are attractive with many having covered picnic tables, but it could certainly use a good cleaning. The sites are fairly level but are unusually narrow. The campground is partially shaded. We were able to use our portable dish to get satellite TV. We had strong Verizon voice and data. Since it is in a small village, it has more of an urban feel than a rural or remote feel, but we found it pleasant. It is fairly quite at night, but not dark as the surrounding houses have some bright lights. We would stay here again to visit St. Joseph. We camped at Lewis and Clark Village State Park in a Motorhome. The closest shopping is across the Missouri River in Atchison, Kansas where there is a Walmart. St. Joseph, MO is about 30 minutes away with many restaurants and shopping. There is a mile long hiking/biking loop that is pleasant to walk. This is a campground on a large lake with lots of lush green grass and huge shade trees. The large shaded sites have electric only, but potable water is available at the free, easy access dump station near the entry/exit. Most sites have a picnic table with a fire pit and some have a wind shelter surrounding the table. The camp host was super nice and helpful. The restrooms/showers were very clean. There is a boat ramp, but it was closed for repairs. The lake side picnic areas are great for bird watching and fishing. 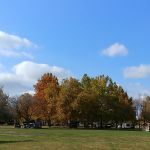 This park is between St. Joseph and Kansas City and within four miles of many restaurants and a WalMart in Atchison, Kansas We camped here in a fifth wheel over the Labor Day weekend and will stay here again. We camped at Lewis and Clark Village State Park in a Motorhome. Only 19 miles to St Joesph. Nice level sites, some paved most are not. Very easy access. We take our bikes and this was a nice area to bike. Check out the overview of the lake. Missouri State Parks are always nice. We camped at Lewis and Clark Village State Park in a Fifth Wheel. This is a state park campground so the amenities are few. The restrooms on the whole are kept clean. I haven't used the showers. We stay here about one weekend a month during the summer months. Our cell phone (Verizon) does not have coverage here so it is a nice break and get away. Sprint and a couple of others do have reception. There is a lake within the park, but the swimming area is always closed due to the Canadian geese and what they leave behind (:. People still use it regardless of the closed signs, but after talking with the ranger, I would not. There is not a whole lot close by, but it is a nice place to chill out. We camped at Lewis and Clark Village State Park in a Motorhome. The MO State Park web site indicates they offer a discount to disabled veterans (Access Pass) but the campground host didn't know anything about any discounts. The bathrooms need attention ASAP. Paint is peeling off the walls and ceilings, shower stalls and curtains have mold on them and there are spider webs everywhere. A lot of litter in the park. I picked up a shopping bag full of stuff in the sites around us. We would go back but use our trailer's facilities exclusively. We camped at Lewis and Clark Village State Park in a Fifth Wheel. We really enjoyed this campground. Very large sites. Quiet and well maintained. The park rangers were very nice. The host was a couple who were very old. He was super nice she acted like she hated being there. Close to water to swim at sand beach area. We camped at Lewis and Clark Village State Park in a Fifth Wheel. It was exactly what we were looking for. The interior roads of the park were flat and paved for our 4 kids to ride their bikes. We never had to worry about them. Lots of trees, very pretty setting. The only bad thing was there is not water at the sites, only electricity, so a weekend is about all we can do. Over all, a very nice weekend. The walk to the lake is nice too. We camped at Lewis and Clark Village State Park in a Fifth Wheel. Are you affiliated with Lewis and Clark Village State Park ?